Samplr – My favourite iPad app! My favourite iPad app Samplr has just had a great new update taking it to version 1.3. This app just keeps on getting better and better! Here is a video I filmed today to investigate the new mode. I only used my little Yamaha Guitalele (six string ukelele tuned like a guitar but a fifth up – bottom string is a B). You can see in the video that Samplr lets you do many creative things with the samples you make on it. Marco Alonso is the Spanish developer of Samplr and he has some quite interesting history. He was largely responsible for the graphics and interface of the Reactable synthesiser. This is that peculiar system that Björk made famous. It is a physical table that you move blocks around on, when the blocks come near to others they “react” and generate sound or affect the sound of others. Reactable is now also available as an iPhone/iPad app though I think it has lost quite a bit of its appeal in the transition. I was not surprised to learn about Marco as there had to be someone of significant talent to come up with this beauty. 1.Slicer – this lets you insert any amount of markers which essentially split the sample into a bunch of triggers. This is great for playing melodies. If you sample a scale played on any instrument and then place the start markers immediately before each note. Chords work extremely well in this mode too. 2.Looper – this lets you set up to three adjustable loops within the same sample. As I mentioned, the touch interface is amazing, it is so intuitive and fast to get stuff looping. There are these circles which are very easy to manipulate. They appear in the different modes and I think are a strong design factor. You are never in any doubt as to what they do, it is so clear to see. There is a sustain button which works in every mode and lets you lock your last touch in place. You can place three different sustains on at any time and they are represented by three coloured dots next to the recording length indicator. There is an x next to the dots which serves as a sustain cancel, cleverly allowing each sustain to be taken off in turn. 3.Bow – The bow lets you touch a portion of your sample and then it loops it very quickly producing quite a smooth textured sound that as you slide around can make for great expressive instrument. Again works great on chords and scales. The analogy of a violin bow is actually quite useful here in conjuring up ideas of how to approach this mode. Imagine being able to bow a sample of glass being smashed? 4.Tape and Scratch – previously these existed as separate modes and were easily my least favourite modes although they do have some cool uses so it makes sense that they are now combined into the same mode. The tape mode lets you set off the sample at different speeds either forwards or backwards. I should mention at this point that whichever mode you are in, the volume of the sample will depend on how high up on the sample you touch. This makes Samplr a very expressive instrument as you can vary the dynamics easily and logically. This works with any notes that you have held with the sustain button meaning that any note or loop’s volume can be manipulated by sliding the circle up or down. Fabulous! The other sub mode, Scratch (enabled by pressing the record deck icon) lets you wickky wiccky scratch your sample! 5.Arpeggiator – This is one of the new features of v1.3 and is extremely cool. Here you can touch various segments of your sample (as defined with the markers) and it will repeat them at the project tempo and based on the musical value ranging from whole notes (semibreves) to 32 nd notes (demisemiquavers). There are also different arp modes – up, down, up and down, random and note order. Again the sustain (or latching) feature really comes into its own here allowing for note sequences to be played but also manipulated both in volume and note choice. It was upon playing with this mode that I was inspired to make my little video and this blog entry. Truly inspiring! 6.Keyboard – Just very simply allows you to play the sample in pitches across a graphical representation of a keyboard. This is not the most interesting mode as we have seen this kind of thing since the Casio SK1 back in the early 80’s but it is handy none the less to have it here. Each of the modes have a few options that let you tailor the settings. Here we have attack quantisation and legato mode. Also each mode has a very simple attack and release envelope which although basic it is great to have and super quick to operate. 7.Loop Player – the final mode has no touch controls and is just a very simple loop player which you can use if you wanted to play over a backing track or existing loop for instance. Sampling is so easy and great fun here. All you do is choose whether you want to sample from the mic or if you want to resample the mix. Resampling is such a laugh as you can get all sorts of nonsense going on then sample it and turn it into something completely bizarre! I have found that sampling from the built in mic can give surprisingly good results. It is quite sensitive and with no gain control you have to position the iPad at a decent enough distance away from what you are sampling to stop it from clipping. I have used it successfully with the my Samson Gomic which is a cool little gizmo that works effectively with a CCK (camera connection kit) but to be honest the built in mic gets good results. I have been promising myself an Apogee Mic at some point as I think that would be the perfect mono mic for Samplr as it has a clip indicator and an adjustable gain wheel plus crucially a very low noise floor. Samplr also contains a truly wonderful effects section which is extremely generous as it gives you not only a multi effect for each of the 6 sample slots but a master effect too. So each multi effect can be a distortion, filter, modulator, delay or reverb all at the same time if you wish and has possibly the fastest and most immediate implementation of a multi effect I have ever seen. You simply touch the icon that represents the effect to enable it then use the kaoss pad like touch square for instant results. The filter for instance can be either a low pass or high pass. Touch the bottom right and the filter becomes a high pass, drag your finger to the right and it morphs into a low pass, drag upwards for resonance. Brilliantly simple but highly effective. All the effect modes have this simple approach and are all the more useful because of it. Seldom with this app are you left wanting more functionality such is its appealing design ethos. Each of the six samples have a dedicated looper and can be set to record any length loops independently of each other. This is cool if for instance you have a short four bar loop on sample slot 1 and an eight bar pad on slot 2 etc. The master stroke here though is the loopers don’t record the sound but what your fingers are doing. This means that you can actually change the mode that the sample is operating in and you don’t lose the loop its just does a different thing. For instance if you were using the Bow to sustain on a small portion of the sample and then switched to the slicer, this would release the sample so it continues to play then jump back to bow mode and returns to the sustaining sound. This has interesting performance potential. I haven’t really mentioned how good Samplr is at manipulating imported drum beats too but really my interest lies more in looking around me for sounds and exploring melodic possibilities. Also now with v1.3 You can sync Samplr to a midi clock although I have yet to try this. Samplr also supports Audiobus so you can use it as both an instrument in apps like Cubasis and Garageband but also you can use it in the record position so you can sample compatible apps directly to it. Audioshare and AudioCopy are also supported. So as you can see I am extremely fond of this app and it is my current favourite iPad app deposing previous top dog Thumbjam! I think that it displays a very forward thinking approach to intuitive design and rewarding user experience and just begs you to explore the creative potential it offers. 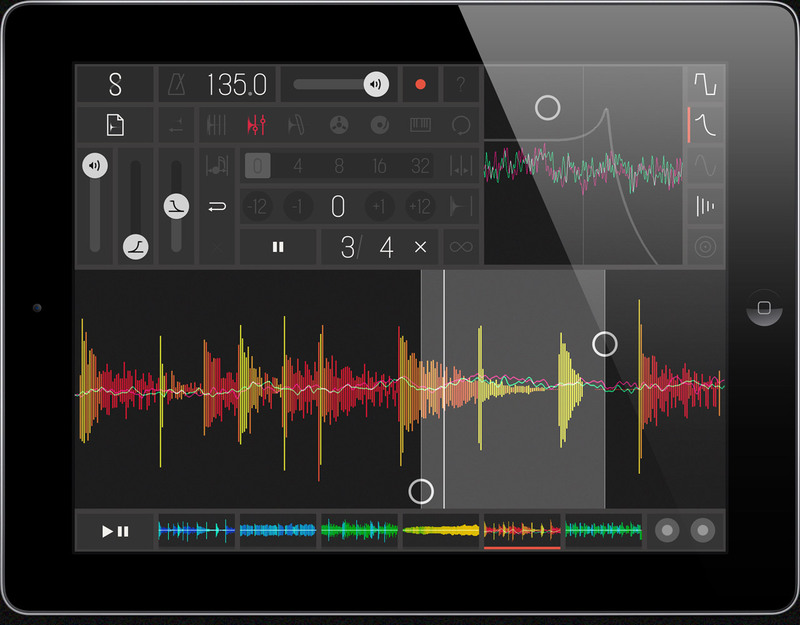 If you are interested in music making, sound design or just messing around with cool toys, you owe it to yourself to check this app out. If you have an iPad it is a no brainer at £6.99/$9.99! If you don’t have an iPad then there is a very good argument to get one just for this app it’s that good! Find it here.